Arnotts Venetians are light biscuits stuffed with coconut and blackcurrants, and topped with white chocolate. 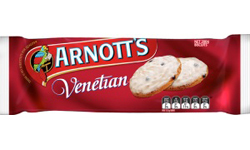 Arnotts Venetians are the best kept biscuit secret of Australia. Lighter than air biscuit base with coconut and currants, the perfect amount of buttery flavour and the thinnest layer of white chocolate on top. Fantastic biscuits, the only problem is that once you've opened the packet you want to eat all of them!